Today the teachers are celebrating the World Teachers' Day to take time out from their rigorous teaching routine from Monday to Friday and to be humbly honored by their pupils and parents. The Balabag Elementary School in the Division of La Carlota City has its own unique way of celebrating this momentous day. A short program was held to recognize the invaluable efforts of the 13 teachers and the school principal. Giving of tokens in the form of flowers, handmade cards and a warm embrace and sweet kisses of the pupils to their respective class advisers made the event meaningful and fun. Added are singing and dancing number from the talented grade five and grade six pupils. And a word of appreciation and a message of gratefulness ensued from the PTA Federation President and from the pupils' representative. The atmosphere on the covered court of the school where the program was held became cool and refresh due to the morning rain. "The feeling is inexplicable once a teacher has received a simple handwritten card from her pupil. I couldn't forget this moment. In my possession right now, I have still the handwritten personal messages of my grade 5 and 6 pupils in La Carlota City Elementary School I twenty-five (25) years ago. I have kept them safe in my box at home. "These pupils are already have their own job, have their children to raise. They have their own family to take care of but yet they never miss to remember me. Even in the Facebook, they are still communicating with me. "The card that I have had today in my hand, would be kept by myself. This would serve a remembrance from this school. The last school I have by the time I retire from the service this october 14. "The card that we receive as the teacher and as the principal of the pupils reflects our diligence, dedication and invaluable service in molding them to be a useful, gainful member of his family, and a law-abiding citizen of the country. "My appreciation is due to all the parents, the pupils and to our supportive Punong Barangay Joel E, Rumbines, and our benevolent stakeholder, City Councilor David T. Baga, Jr. I know I would be missing all of you for I would be retiring on October 14. Anyway, this is only a farewell but not goodbye for we'll be seeing each other." On teachers' day, our pupils from kinder to grade six, showered me of their sweet kisses and there is ONE PUPIL who gave me this card which makes me a man of principle with a principal mind. Thank you, Rachel. I would treasure this card. You have made my day so to speak. PTA Federation President Sixto "Dodoy" Pancho, Jr. thanked everyone who made this special occasion for the teachers possible on his opening remarks. 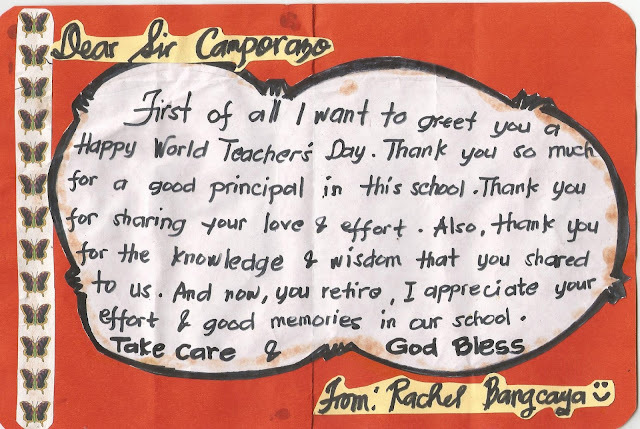 Justine Barcenas, a grade six pupil took the honor to say something about the teacher on her gratitude message on behalf of the pupils. "All of us have been students at some stage of our life and have benefited much from our teachers. "Celebrating teachers' day is a wonderful opportunity for us to show our gratitude and appreciation to our teachers. To pay reverence and gratitude of their selfless efforts in shaping us and enriching the education system." The pupils, the parents, the teachers and the school principal have departed their ways with great satisfaction and full of the spirit of gratefulness that they have shared their part in making everyone happy as the world celebrates the Teachers' Day. Teacher's day is really an awesome day.I still miss my school days where we did celebrate teacher's day every year with full of joy and respect. Happy Teachers Day. It's really great that you've treasured messages from your students. Happy Teacher's Day sir and wishing you the best in your retirement. I know that you will continue educating the youth in other ways.